We’d love your help. Let us know what’s wrong with this preview of Marty Frye, Private Eye by Janet Tashjian. Marty Frye is not your ordinary private eye. Marty Frye is "the poet detective"--he solves petty crimes by turning rhymes. In the course of a busy day, Marty tracks down his friend Emma's lost diary, finds a box of toys missing from Mr. Lipsky's store; and locates a bag of disappearing flour for his little sister, Katie. Although he hits some dead ends along the way, Marty Marty Frye is not your ordinary private eye. Marty Frye is "the poet detective"--he solves petty crimes by turning rhymes. In the course of a busy day, Marty tracks down his friend Emma's lost diary, finds a box of toys missing from Mr. Lipsky's store; and locates a bag of disappearing flour for his little sister, Katie. Although he hits some dead ends along the way, Marty Frye combines his three favorite hobbies--sleuthing, rhyming, and climbing trees--and leaves no case unsolved or unrhymed. To ask other readers questions about Marty Frye, Private Eye, please sign up. Tashjian, Janet Marty Frye Private Eye: The Case of the Stolen Poodle & Other Mysteries, illustrated by Laurie Keller, 88 pages. Christy Oviano Books (Henry Holt), 2017. $16. Language: G; Mature Content: G; Violence: G.
Marty Frye is a rhyming guy and also a private eye. The first case he solves is: The Case of the Angry Nurse. Nurse Laughlin’s on a rampage because someone stole all of her tongue depressors. 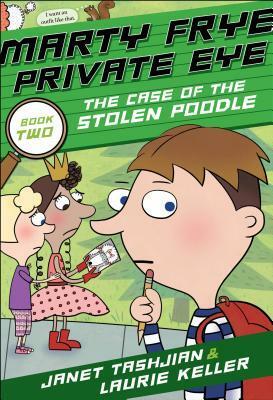 The second case is: The Case of the St Tashjian, Janet Marty Frye Private Eye: The Case of the Stolen Poodle & Other Mysteries, illustrated by Laurie Keller, 88 pages. Christy Oviano Books (Henry Holt), 2017. $16. Language: G; Mature Content: G; Violence: G.
Marty Frye is a rhyming guy and also a private eye. The first case he solves is: The Case of the Angry Nurse. Nurse Laughlin’s on a rampage because someone stole all of her tongue depressors. The second case is: The Case of the Stolen Candy. Someone had stolen over $100 of hot jawbreakers. The final case is: The Case of the Stolen Poodle. Darlene the poodle belongs to their neighbor, Jackie, and she’s missing. It takes the poet detective all day, but he squares all three mysteries away. Book Two of Marty Frye Private Eye is just as charming and full of rhymes as the first. The mysteries are simple enough to solve quickly, but complex enough for children to be intrigued and entertained. The black and white cartoon illustrations give the book a mystery noir feel and are perfectly coupled with the text. Put it on your shelf to read next. A very fun and entertaining book! Be sure to check out my full review on my blog! This one popped up when I searched for poodle books at my library. My 7 yr old likes mystery stories (Nancy Drew Clue Crew and Owl Diaries) and she liked these too. It's a easier chapter book with larger font and b/w illustrations on every page. The fact that Marty is a poet detective is kind of a fun way for some rhyming text too. Three mysteries were included and the charades are broken down by case, clues, suspects, A-ha! We've requested the next one from the library already.